Have you ever wondered what you can do to help keep your mind sharp and at its best? The choices you make in your diet do not just affect your waistline. Although our genes do play a role in if we acquire certain degenerative diseases such as Alzheimer’s, the brain is a powerful organ and feeding it the optimum fuel or “brain food” is proven to keep it performing at its optimum level. Make sure to include these top five brain foods to your daily diet for their strong mental and memory protective benefits. High DHA levels are linked to increased dopamine and serotonin, the same brain chemicals that antidepressants boost. Eat fatty fish. Fatty fish such as wild salmon, tuna (fresh or canned), trout (farmed trout is better than lake trout due to mercury) and sardines, are rich in omega -3 (DHA) fatty acid which is very important for heart health but also for reducing the risk of acquiring Alzheimer’s disease and depression. Research has shown that eating fish twice per week can slow memory loss by aging by 10%. Add berries. 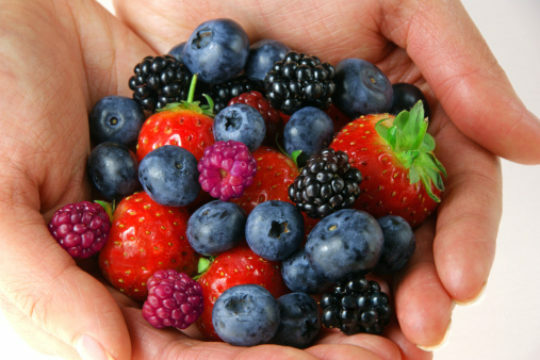 Whether fresh, frozen or from juice (watch your juice intake as it can be high in calories), make sure you include a variety of berries, such as blueberries, cranberries, strawberries, and raspberries, as all of these little jewels are chocked full of powerful antioxidants that have a multitude of benefits from reduced risk of cancers, decreased infections and memory protection. Toss into salads, top yogurt or cereal, or add to your smoothie to give your brain a boost. Eat your greens. From leafy greens like spinach and kale, to cruciferous veggies like broccoli and Brussels sprouts, it has been found that those who ate the most of these green veggies had the least memory lost over 25 years. Research has shown that broccoli along with other vegetables slow the aging process of the brain allowing it to work efficiently throughout life. For vegetarians or vegans being able to get some omegas from veggies is great. Seaweed is a great source of DHA and is used to make vegetarian DHA supplements. Ground flax seed, canola oil, broccoli, cauliflower and red kidney beans are other good vegetarian sources of omega-3s. Amazing avocado. Often thought of as a vegetable but actually a fruit, avocadoes are rich in fats but they are important essential monounsaturated fats that promote healthy blood flow, which the brain requires for maximum effectiveness. They also help lower blood pressure, or hypertension, reducing the risk for cognitive decline. And one fourth to one half is all you need per day to get the benefits from this fruit. Nuts about nuts. Eaten in moderation, nuts are a source of calorically dense fats, mostly the heart healthy monounsaturated fats. They also contain an excellent source of Vitamin E which slows cognitive decline keeping your brain healthy long-term. A serving of nuts is 1 - 1.5 ounces so sprinkle on your salad or portion out a serving for a brain-boosting snack. Holly Clegg has offered expert advice on quick, flavorful and healthy eating for nearly 20 years through her best-selling trim&TERRIFIC® cookbook series. Thank you to Lauren Weber, DO, who acted as Medical Editor for this article.